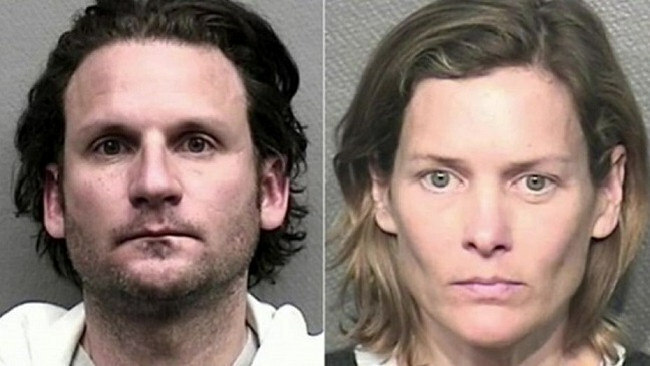 STAGED photographs of a man and woman allegedly targeted in a Houston murder-for-hire plot, showing them pretending to be tortured and bleeding in grisly scenes, were shown in court during the trial of an ex-lover accused of ordering the hits. Police used the photos of Meghan Verikas and Mack McDaniel to build a case against surgeon Leon Jacob, who allegedly offered undercover officers $20,000 and luxury watches to murder them, Fox News reports. Ms Verikas ended a three-year relationship with Mr Jacob in January 2017 after an alleged assault and filed charges of domestic violence and stalking against him, the Houston Chronicle reported. Investigators arranged to stage the photos to convince Mr Jacob that his ex was abducted. "I sat in a chair in a warehouse and they zip-tied my hands and my feet and put duct tape around my mouth to make me look as though I had been kidnapped," Ms Verikas told the court on Wednesday. "I had sat in that parking lot for an extended period of time so I was crying and really upset." Defence lawyers claim Mr Jacob didn't want his ex-girlfriend killed, but run out of town so she couldn't testify against him on the stalking and assault charges, according to Fox 26. However, he was heard in an undercover police recording saying "when she goes away, this all goes away". Mr McDaniel's former wife, Valerie McDaniel, a veterinarian who was dating Mr Jacob at the time of the alleged murder-for-hire plot, was also charged with solicitation of capital murder. But she jumped to her death while on bond shortly after her arrest last March. She reportedly owed Mr McDaniel $1.25 million in a divorce settlement and had been locked in a custody battle over their daughter, then 8. "She was under the belief that I was going to carjack him ... And I was going to put a bullet in his head," one of the undercover officers told the court, referring to the slaying that Mr Jacob allegedly ordered. In a secret audio recording that was played, the officer is heard saying: "We'll make it look like a carjacking. Put another bullet in his head. We call that the double-tap." The officer then tells Mr Jacob, "You just have to give me the go-ahead," according to the Houston Chronicle. In another recording played in court, taken during talks at an Olive Garden restaurant, Mr Jacob suggested to the officer to inject a lethal drug into Ms Verikas' heart. "Inject her heart with potassium chloride, stop her heart, untraceable," Mr Jacob was heard saying to the fake hitman. To make the staged photos realistic, police said the targeted exes agreed to be splashed with bloody make-up. Ms McDaniel's ex-husband was pictured as a slain corpse. Mr Jacob's ex-girlfriend was photographed bound and gagged. When they were shown "proof" of the crimes last year, prosecutors said Ms McDaniel and Mr Jacob got queasy. "They didn't want to look at the pictures," Harris County Assistant District Attorney Nathan Moss had said at the time. "They said, 'Oh we don't want to see them but here's the money we owe you.'" The pair was then taken into custody. The defence in the ongoing trial is expected to make the case that Mr Jacob was pressured by the undercover officers to order the murders, and he is expected to take the stand himself, CBS News reported. Jacob could face life in prison if convicted.